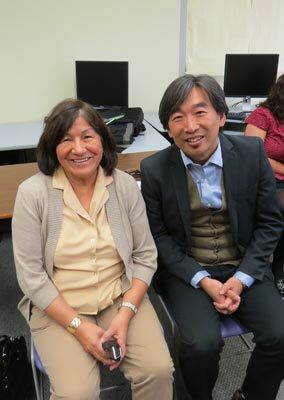 Photo: College of the Rockies Vice-President, Education, Stan Chung and Ktunaxa Nation Council Chair Kathryn Teneese celebrate the opening of the Ktunaxa classroom at the College. College of the Rockies Vice-President, Education, Stan Chung was pleased to celebrate the opening of a Ktunaxa classroom at the College on Wednesday, April 22. Also present at the event was Ktunaxa Nation Council Chair, Kathryn Teneese. The dedicated Ktunaxa classroom will provide a visible point of continuity for new or potential aboriginal students to connect with current Ktunaxa students. The room will host programs such as Bladerunners – an employment training program focussed on providing job readiness skills and education – and the Ktunaxa Workplace Essential Skills training that are currently held in other locations within the College. It will also provide a location for cultural activities, workshops, drop-in sessions, coaching and mentoring sessions and more. After dedicating the room for Ktunaxa use, College and Ktunaxa representatives celebrated together over a meal of elk tacos.